IV-II cent. B.C.Gold, paste: smithery, stamping, engraving, soldering. Height 8,6 cm, diameter 8,5 cm. Inv.No PCP 3471 Gold, paste: smithery, stamping, engraving, soldering. Height 8,6 cm, diameter 8,5 cm. Cylindrical crockery with erect sides, flat bottom and disk-like cover with cylindrical lug, which ends in hemisphere with rosette inside. 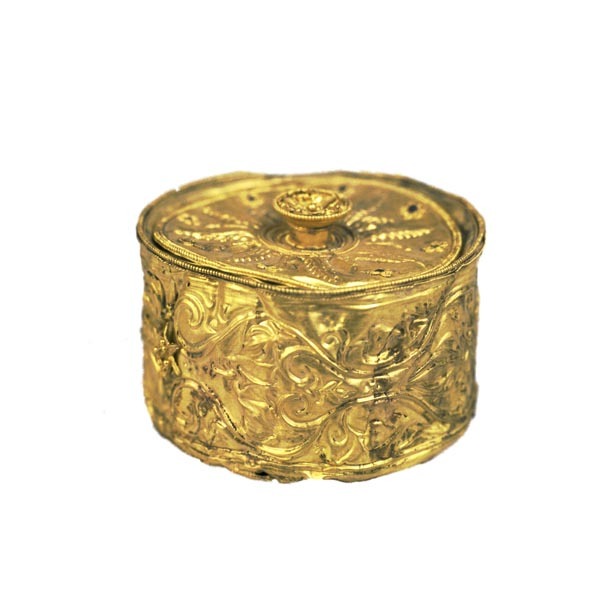 The pyxis cover edges and body is pictured with ribbed wires. The cover surface is pictured with imprinted ornamental pattern in a form of acanthaceae petals with rosettes between. There are relief images of the mythology theme at sides of it.